Sarah Holbeche noted in her diary in September 1863 that remedying woodworm damage in the interior of the Parish Church had cost £723. The work had revealed that the church roof was unsafe, and so the church was closed while a new roof was built. The opportunity was taken to improve the clerestory windows, but the main visual effect was to raise the level of the ridge of the roof by ten feet - previously the nave had a flat roof covered with lead which made the tower appear more prominent; one contemporary complained that “the peaked roof dwarfs the noble tower”. A lower roof had been intended, but there was a small window on the east wall of the tower, slightly off centre, and the steeper pitch required to accommodate this took the ridge level above the string course of the tower. A terse entry in Sarah Holbeche’s diary reads “Easter 1864. Church re-opened as altered”. 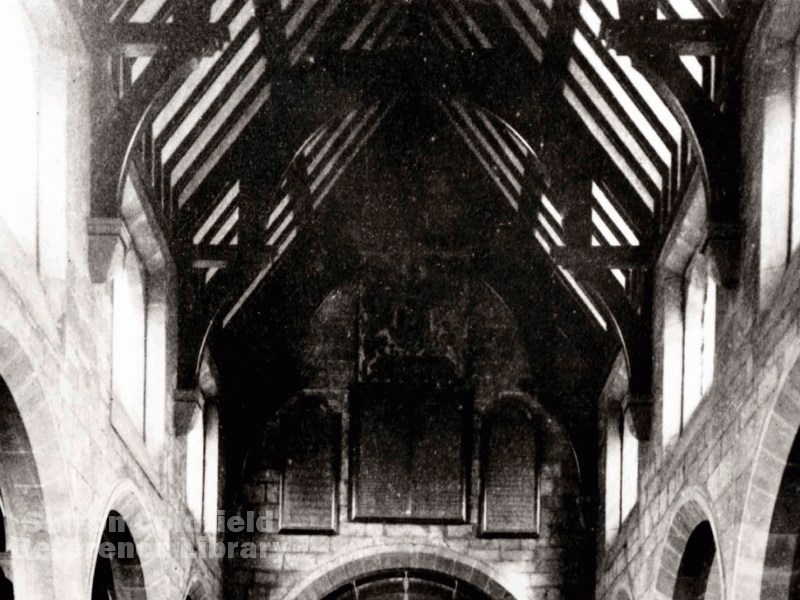 The new ceiling of the nave was left plain, the hammer beams and timber-framed plaster panels being deemed handsome enough. 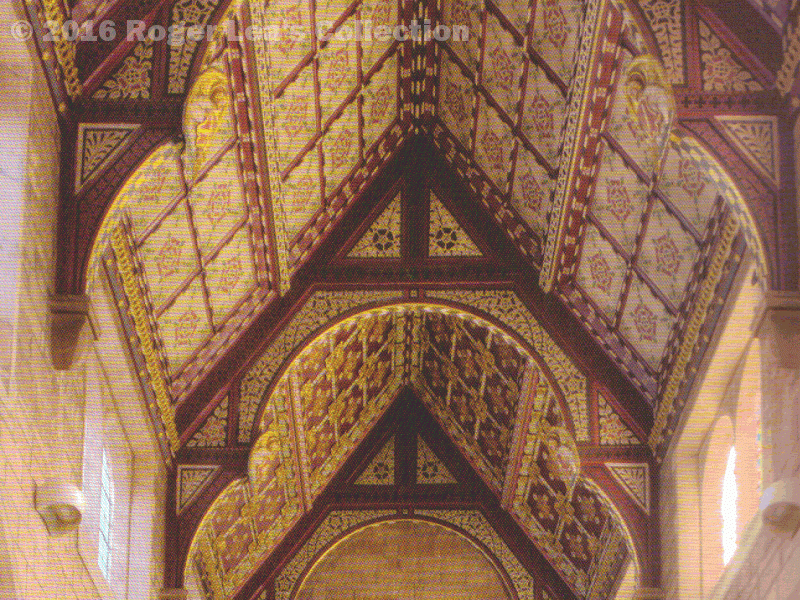 It was not until 1929 that the ceiling received its present colourful treatment, to a design by C.E.Bateman. The design is based on early English church ceilings, described at the time as “marking a step of very considerable importance in the history of modern English church decoration”. Charles Bateman qualified as an architect and joined his architect father’s practice, which became Bateman and Bateman, in 1887. Bateman became known for grand Arts and Crafts houses and several vicarages, including the beautiful one at St Peter’s, Maney. C.E.Bateman designed a number of Arts and Crafts houses in Sutton, including one for himself at 7 Anchorage Road. Bateman’s treatment of the nave ceiling was bold and colourful, a series of square panels with a floral motif based on the Tudor Rose, the beams and timbers being gilded and patterned. Bateman had already in 1914 decorated the chancel ceiling, a plain barrel-vaulted roof which he divided into squares with a floral design, but with an additional band of panels depicting angels. In1929 his masterpiece, the Vesey Chapel roof, was completed, a flat ceiling of even more elaborate designs, divided by friezes of gilded birds and leaves symbolising Sutton Park. The re-ordering of the church due to take place in 2016 should make it more accessible and show off the remarkable ceilings to better effect. Bateman lived for some years in Anchorage Road, frequently travelling down High Street, an approach to the town which he felt could be much improved. He campaigned for the creation of an open space in front of the church in place of the jumble of dilapidated buildings occupying the site; in due course the Corporation acquired the properties and demolished them to make way for Vesey Gardens, opened in 1939. The final design of the gardens was prepared by C.E.Bateman in collaboration with the Borough Surveyor, Tom Porter.